Graffiti abatement is a 17 Billion-dollar-a-year industry in the United States. That’s right, 17 BILLION dollars—more than four times the total amount spent on arts funding in 2012 by government, state, and local agencies ($3.58 billion, according to a Grantmakers in the Arts report). But how much of that 17B is wisely spent? According to an investigative report by NBCBayArea, graffiti cleanup crews in San Jose routinely overcharged for abatement services and/or billed the city for services they never performed. In June 2012, the city outsourced their abatement program to a Los Angeles-based company called Graffiti Protective Coatings, awarding the company a contract worth $3.1 million over five years. GPC received the contract, which paid the company .40 cents for each sq. foot of abatement performed, ostensibly as a cost-saving measure. Yet in the end, taxpayers ended up footing the bill for price-gouging. The NBCBayArea investigation looked at 25,000 work orders by GPC and found some alarming results: two swings in a city park, whose area measured about one square foot each, were billed for cleanup at 40 square feet – 20 times the actual cost. A utility pole measured at 12 sq. ft was billed at 58 sq. ft. A mailbox was listed as covering 205 sq. ft; 384 stickers on stop signs were billed at 5 sq. ft each. Such creative accounting recalls the egregious overbilling of defense contractors like Boeing, who once charged the government $71 for a set of four metal pins which cost just four cents. It’s hard to single out just one company, however, since just about every defense contractor does it; Googling “defense contractor overcharge” brings up more than 55,000 results. Unlike defense contractors who undergo official Pentagon audits, the abatement industry is subject to little if any financial oversight; when work orders are submitted, few questions are asked by city departments, who typically do not have the resources to investigate these charges, as NBCBayArea did. And as a recent report out of Houston shows, abatement overcharging isn’t an isolated incident: anti-graffiti crews there routinely charged one hour of labor for as little as two minutes of actual work, a process a reporter called “akin to paying a painter for watching paint dry.” In some instances, abatement crews have been discovered painting graffiti themselves, so that they can then get paid for erasing it. What’s even more alarming about GPC’s overbilling is that despite the costly abatement efforts, graffiti in San Jose is up. 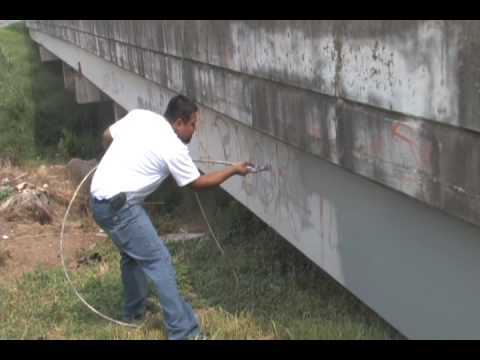 A city-issued report found that instances of graffiti had increased in 7 out of 10 districts in 2012. 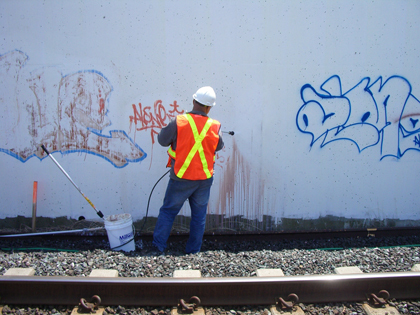 That’s a far cry from 2006, when San Jose’s head abatement enforcement officer, Rick Stanton, declared victory over vandalism, claiming that anti-graffiti efforts had reduced the number of tags 99.88% over a seven-year-period, to just 129 for the entire city in 2006 (down from 71,541 in 1999). Stanton is now a highly-paid “graffiti consultant” who routinely speaks at national conferences on abatement and anti-graffiti issues and advertises anti-graffiti summits “tailor-made for each city” which promise to rid cities entirely of graffiti through a combination of zero tolerance policies and enlisting unpaid volunteers. San Jose’s rise in graffiti is consistent with what studies have shown about zero-tolerance policies: namely, that they don’t result in long-term solutions and at best effect a short-term remedy while arming politicians with tough-on-crime rhetoric. Because graffiti is such a hot-button issue, it’s led to the escalation of such policies, which have failed to produce meaningful results over time, yet have lined the pockets of anti-graffiti consultants and created a monster—the abatement industry—with very little accountability. Besides leaving numerous unanswered questions about implementation and enforcement, Oakland’s new anti-graffiti ordinance also fails to address the flaws in the city’s current abatement strategy, which currently has no measurable way to prove its effectiveness or cost-efficiency. As it now stands, the city’s abatement model involves repainting portions of walls with mis-matched colored paint, which only offers a brief respite from taggers and cannot be considered a long-term solution, since it requires frequent repainting. Oakland spent $1,040,000 on graffiti abatement in fiscal year 2011-2012, according to a recent article in the San Francisco Business Times. The article noted that the city employs three building painters who “spend most of their time covering up graffiti on city buildings” as well as a four-member full-time abatement crew. Yet other than noting approximately $75,000 in paint costs, there’s no breakdown in the article of how the rest of that $1m+ was spent. It’s unclear, for instance, if the $965,000 left over after subtracting the cost of paint went to pay for the seven employees—which would work out to $137,857.14 each—or if there were other, unnamed expenditures. What also remains unclear about Oakland’s abatement efforts—which included not only the $1m spent by the city, but $300,000 for a Men of Valor program in East Oakland funded by city’s now-defunct Redevelopment Agency, which ended in 2012—is their effectiveness in light of tag recidivism. An Oakland North article from 2011 noted that any reductions in tagging were short-lived, and that already-buffed walls required frequent re-removal. Currently, the city doesn’t track instances of tag recidivism, so it’s hard to know how cost-effective abatement is, or if it represents anything more than a stop-gap, or temporary solution. The Men of Valor program was commendable in that it hired ex-offenders, and paid them at a level above minimum wage. But graffiti abatement isn’t exactly a career path, and abatement efforts don’t do anything to stop taggers from tagging in the first place or divert them into more constructive activities. What’s missing from current abatement strategies is a third component to go along with the punitive aspect of criminal penalties and fines and simple abatement. While there will always be a need for these two approaches, zero tolerance policies haven’t proven to be effective solutions, while abatement is temporary at best and raises lingering questions about cost-effectiveness, as well as the lack of oversight and financial accountability around billing practices. Ironically, Zsabo’s community-based solution mirrors CRP’s program work. In fact, our model brings together public art murals with community clean-up efforts and partnerships with non-profit organizations engaged in youth development, restorative justice, food justice, environmental awareness, and urban forestry sectors, along with city officials, business associations, and neighborhood groups. The answer to the graffiti problem isn’t throwing money down the abatement black hole or instituting stricter zero-tolerance policies. Any viable solution must revolve around the creation of sound, forward-thinking policy which avoids knee-jerk reactionism and repeating mistakes which have been made in the past. San Jose’s example shows that permanent reductions in graffiti vandalism through zero tolerance measures aren’t sustainable, and that with current abatement strategies, sometimes you get less than you pay for.